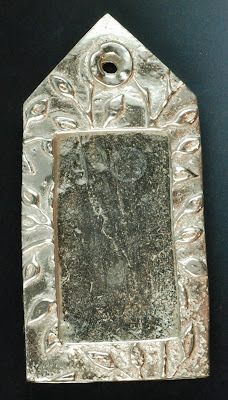 As I mentioned a few days ago, both of my pieces fired during the workshop exhibited the glitter effect known to sporadically manifest in silver clay. One piece had fine glitter that typically polishes right out. From the photo below, however, it's apparent that the crystal grain sizes on my glittery frame are very large. Small particles of vermiculite are visible in the crevices. They appear to be wedged into place. I had to literally dig the vermiculite out of the filled interior of the frame, where it appeared tightly packed. Over the last few days I've tumbled this piece with stainless steel shot for many hours, but failed to completely remove this extra texture. Although fairly smooth and shiny in some areas, in places the piece looks slightly rippled. I suspect the temperature in the kiln was dangerously close to melting this piece. My recent experiences with this sparkly effect has me researching the issue. This topic has been the subject of frequent discussion within the metal clay community, specifically how to get it deliberately or how to avoid it. Since metal surfaces were my specialty during my scientific research life, I thought I'd put together my personal views on what is happening in this situation, what might cause it or enhance it, and how it might be avoided. Necessarily I should add that I can't PROVE my hypothesis. As a good scientist I'm putting together my observations, trying to encompass data relayed to me from the experiences of others (but totally unverified by me at this point), and filtering that through my understanding of how metal surfaces behave. As a prelude, let me state that I earned my doctorate in physical chemistry/chemical physics for studies on silver surfaces. In the course of 15 years of research, I used (among other things) atomic resolution microscopes to study metal surfaces and even published the first verified observations of metal atoms by scanning tunneling microscopy, thought to be impossible, but accepted after my work. In the course of certain measurements, I became an "expert," whatever that is, on growing atomically flat silver onto mica surfaces. When silver clay sinters, the organic binder is combusted and then the fine metal particles adhere to one another. Silver metal in its lowest energy state forms a metal single crystal, with all atoms perfectly arranged. Given enough thermal energy and time, atoms on the surface of the original small particles in metal clay will migrate to the edges of tiny crystal domains and attempt to achieve that crystalline structure. Pores within the sintered metal, due to voids between the original particles, will slowly fill, and shrinkage will occur. Small crystal domains have been clearly observed in SEM (scanning electron microscopy) micrographs of sintered silver clay, imaged by Tina Carvalho and published by the PMC Guild here. The rough surface of freshly fired silver clay appears white due to the scattering effect of these small crystals on visible wavelengths of light. When the surface is burnished, those tiny mountains are physically flattened, ruining the regular crystalline surface, but imposing enough smoothness to reflect light. However, reintroducing the silver to the kiln in a repeat firing will allow the crystals to start to grow again and return the silver to the white state. By holding the temperature of the metal clay elevated for an extended time, expectations would be that the crystals would continue to grow in size, perhaps eventually reaching a size that would be able to reflect light coherently enough to observe macroscopic crystal domains, i.e. domains visible to the eye, with the appearance of glitter. Alternatively, since the mobility of atoms on the surface depends upon thermal energy, increasing temperature will speed that crystal growth. 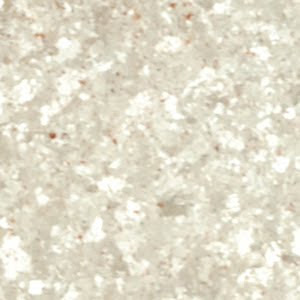 Tim McCreight has speculated that the occasional observations of a glittery surface of freshly fired metal clay are due to growth of large crystals, perhaps caused by elevated temperatures or slow coolings, which seems consistent with the picture of microscopic processes presented here. However, some artists never observe such effects, even with extended times at elevated temperature. This posits the question: is something else involved, operating in some situations and not in others? One possible explanation is the observation that artists who note this phenomenon were often (but not always) using vermiculite or fiber blanket to support the work. How would this material play into the microscopic process discussed here? The composition of vermiculite is particularly suspect since it is chemically related to mica. The atomic spacing on the surface of certain types of mica provide ideal spots for growing atomically flat silver surfaces because it matches almost perfectly the desired atomic spacing for silver. Everyone is familiar with that eggshell corrugated foam -- balls pack so nicely into that regular array of holes. 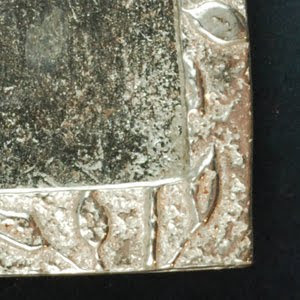 The mica provides exactly that template for growing crystals of silver. Thus, the presence of such templates can provide nice nucleation sites to induce growth of large crystal grains. Ceramic fiber blanket, like that used by glass lampworkers or ceramicists, may have similar structure, but that's pure conjecture. So, my suspicion is that several factors affect the appearance of the glitter effect. High enough temperature may allow the surface to move a lot. So overfiring at temperatures higher than the typical 1650 degrees would tend to increase the growth of larger crystals. Long enough time at high enough temperature may permit the surface to move more and hence grow the crystals larger. This accounts for conjectures that cooling down slowly may be correlated with the glitter effect. Extra assistance in the form of nucleation sites from vermiculite, fiber blanket, kiln shelves or other materials placed in contact with the silver may help form large grains more quickly than if there were no template present. Thus, the irregularity of the situation that causes the glitter effect depends on the exact combination of these factors present, making different artists see the effect under different circumstances. Right now, if I wanted this effect, I'd try putting the surface in contact with small particle vermiculite (to give good contact), overfiring, and holding for an extended time. Since I don't want the glitter effect, I'll try avoiding vermiculite, checking my firing temperatures to ensure they don't exceed 1650, and ramping quickly, holding two hours only, then quenching. And I'll keep collecting data to help refine my scientific understanding of what's happening. This is only a working hypothesis, after all, and subject to change with the addition of new information. Vickie this is really interesting! I have never seen this effect so can't add anything useful except that I have never used vermiculite as a support. I nearly always fire for 2 hours at 800 degrees C (sometimes fire a piece more than once but still at the same temperature). I usually use fibre blanket as a support in the kiln. What a great article Vickie! If I didn't know you were a scientist before, I sure do now. ;D I think you should submit it to Fusion. I bet they;d love to reprint it. Mind if I do a post on it and redirect my readers here? By all means, more discussion is always welcome. I'm going to amend the post to ask for observations from others. An article for Fusion is a good idea, too. Maybe I'll look into that. Wow! I love to read this Vickie. Very interesting. I do have some of that glitter look in some pieces but not as extreme as yours. I have used vermiculite since I started working with metal clay. You have to send this to FUSION, it is a very interesting topic. I am sorry you are still trying to recover your piece, it is very beautiful. Great post! From the very first firing in my kiln (1650 for 1 hour on a shelf, left to cool in the kiln) I get the glitter (in varying degrees) almost every time. I'm surprised when something comes out white. These days I mostly fire at 1650 for 2 hours on a fiber blanket, and pull the pieces out while hot. I had a piece the other day that was about half white and half glittery - I thought about photographing it but didn't get around to it. I get the sparkles off quite easily with a stainless brush. I get this effect almost every time I fire in the pieces that are closet to the heating element. My pieces are on the kiln shelf and not on vermiculite or fiberbanket. I rarely have this happen in vermiculite. I fire 1650 for 1.5 hours. I crack the kiln at 1200 and slowly open the door all the way and remove at 450. I don't think how they are removed has anything to do with it as I have a window and can see the sparkle before I open the door. The older my kiln gets the more sparkle I seem to be getting. Thanks for the data, Jascha! This is consistent. Nucleation sites from vermiculite can speed the process, but if the temperature is high enough it will happen anyway. It is well known that kiln temperature increases with age, because the thermocouple degrades and reads lower than reality. You might consider using a secondary method to test your kiln -- either another pyrometer or a cone system to check the actual temperature, in the interests of preventing yourself a meltdown. For your data/experiments, this just happened to me for the firs time. The interesting thing, is that it only happened on one piece, the piece I had fired multiple times after adding things. The pieces that were on their first fire came out fine. 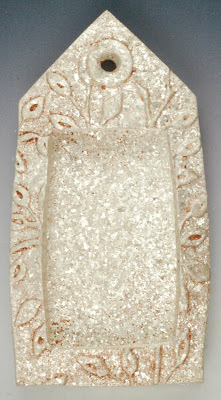 The glitter piece was close to the kiln door, but parallel with other pieces (although those were smaller). I did not use vermiculate because the fired piece no longer needed it, and the rest of the pieces had a flat side. I use a paragon SC2 at 1650 for 10 minutes using PMC+. My glitter was mild enough to tumble out (thankfully since I have been working on this pendant forever!). Good luck.